What drives a girl to fight Batman with a baseball bat? Honestly, we're still trying to figure that one out! We saw Suicide Squad and we're still trying to understand Harley Quinn. She's completely unpredictable—one second she's doing gymnastics in her cell in Belle Reve and the next she's battering an army of thugs with a blunt weapon of her choice. Of course, that makes teamwork a little bit rough for her, but the rest of the bad guys of the Suicide Squad are just going to have to learn how to play nice with her to get the job done! You're a bit of an enigma too, aren't you? 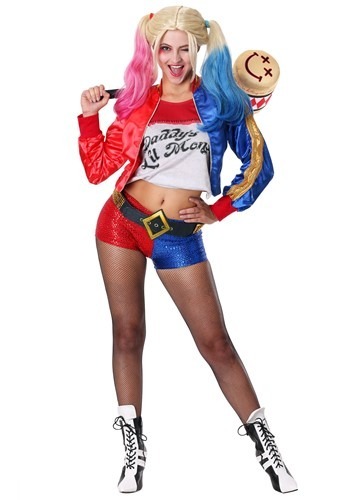 Well, then you'd probably fit right in with the rest of the gang when you wear this licensed Harley Quinn costume. This deluxe Suicide Squad costume comes straight from the 2016 movie and it recreates Margot Robbie's signature outfit that she wore while pounding goons to a muddy pulp! The costume comes with a matching top and shorts combo. 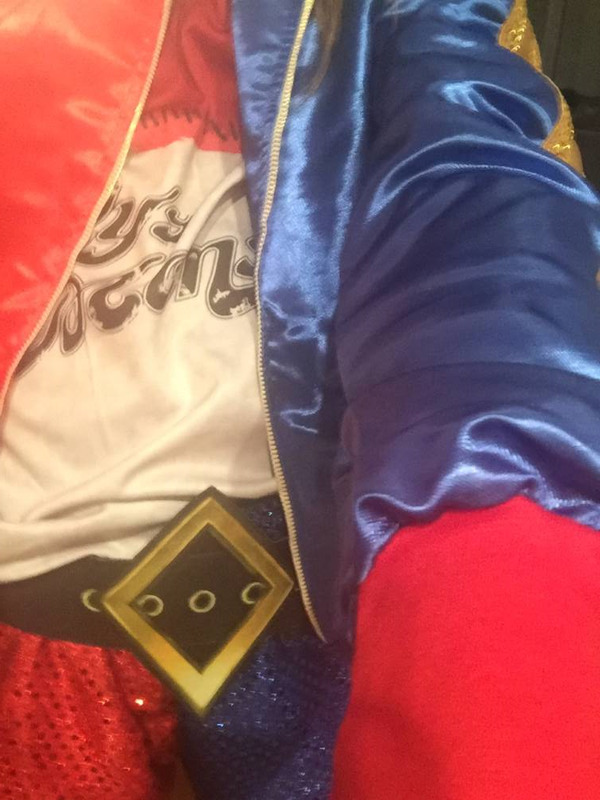 The pullover jacket has a blue and red theme, while the belt fits with Velcro to help you transform into the wildcard character. The sultry fishnet tights put the finishing touch on the look. Once you have the entire outfit on, you may find yourself craving some wild antics in Gotham City. Just make sure you drag Mr. J along for the ride, since you'll need a partner in crime for your tour of mayhem! Bad bad bad quality! Very disappointing. I ordered a large because that’s the largest size this comes in and the top fits nicely. The shorts are rather tight and the leggings are impossible to get on, luckily I had some spare ones in the closet from a previous outfit! I wish they sold separates in this costume. I wear a size 2 and ordered the small and I probably need the large in the shorts but small in top combo. Beware if you have curves! True to the size. So happy with my purchase and cant wait to wear it.